Hailed by music critic Michael Sherwin as "one of the finest artists I've ever heard, possessing a blend of passion, expression, flawless intonation, assertiveness, suavity, and beauty of tone", 24-year-old Eru has been charming international audiences with her unparalleled artistry and grace since age 6 as a multi- faceted and award-winning soloist and principal with numerous orchestras. Eru is a member of the International High IQ Society and at age 16, she was accepted to the Juilliard School under the tutelage of the late David Soyer, widely considered to be the foremost master of cello pedagogy and a distinguished pupil of the legendary Pablo Casals. Eru's young career path has included major performances and recording sessions with British and Hollywood Academy-Award winners. And has collaborated with major pop recording artists in both the US. and Japan, including a recent contribution as a soloist on Demi Lovato's new album, Confidence. She has also performed on numerous video game soundtracks, including Sony's popular video game series, Everquest..
Eru has performed as guest soloist at celebrated venues such as Avery Fisher Hall, Lincoln Center, Carnegie Hall, Walt Disney Concert Hall, Wembley Arena, Mitsubishi Electric Halle, Neal S. Blaisdell Center, Adrienne Arsht Center and Shanghai Symphony Hall. She has also regularly performed with symphonies all over the world including the Royal Philharmonic Orchestra in London, the Hawaii Symphony, Orchestra in Dusseldorf, and the New York City Ballet to name a few. In Fall 2014, Eru performed as a guest soloist with the Shanghai Philharmonic in a concert in which she was invited as a foreign friendship ambassador starring in the world premiere of Chinese composer Peng-Peng Gong's historical Rejuvenation Symphony - the largest classical symphony in Chinese history. This was a 100 minute piece written for Eru by the Composer and Director of the Shanghai Philharmonic. Eru has also dazzled audiences on television on a variety of broadcasts, in addition to being featured in a highly regarded television project as a young prodigy at age 12. 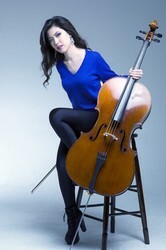 This year she made an appearance in a TV documentary filmed in Warsaw, Poland where she performed a cello sonata by Chopin as the featured performer, and was recently flown to Tokyo to record the narration for this series of classical music documentaries entitled "A Musical Journey through the birth of Western European Music". Eru was invited to be a guest of honor at the largest anime convention in the world, Anime Expo, at the Los Angeles Convention Center. (Guest of Honor this year also included the legendary rock band KISS). She most recently performed as star cellist at a gala concert with Nathan Pacheco and David Archuleta, at the Adrienne Arsht Center in Miami, Florida. Last year Eru was selected as an honored recipient of a life-time loan of an 1835 Italian cello sponsored by Violin Assets in Germany.